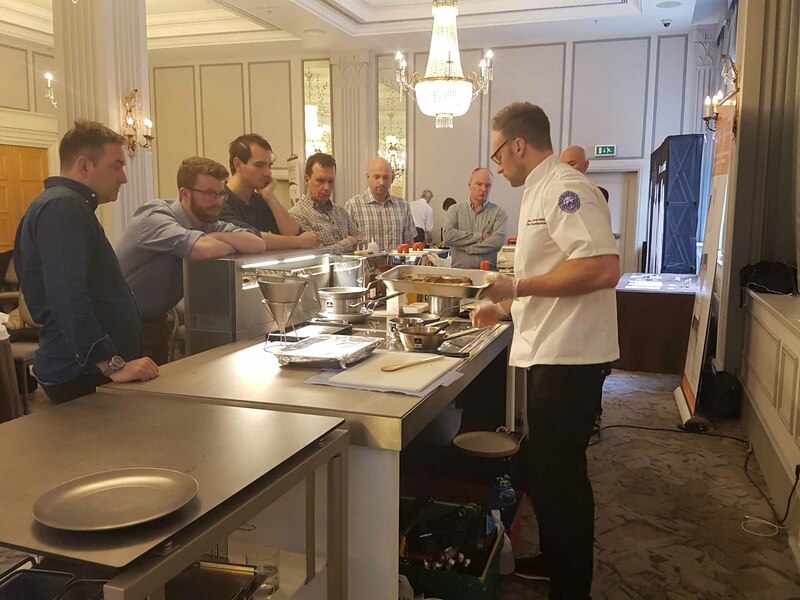 The Live Cooking Event took place on the 23rd and 24th April, promoting the three brands (Clifton Food Range, Livecookintable and Signature FSE Limited) to chefs and catering distributors from around the London area, showcasing the products through a live cooking demonstration with RAF Chef Lecturer and National Chef of the Year 2018 finalist, David Davey-Smith. Signature FSE Limited are London based sales agents who support leading European brands of premium food service equipment for cooking, preparation, display and serving. Established since 2003, the company has become a specialist in light equipment and buffet presentation. Livecookintable is portable cooking furniture, satisfying the needs of chefs and caterers wanting to have a customised and integral set-up for their events, buffet areas, tastings or fairs. This concept is ideal for hotels, and is suitable for indoor and outdoor use. The aim of the day was to work with our London based distributors to educate them in the use of sous vide in restaurants and why chefs see sous vide as a must. Clifton Food Range also gave hands on training highlighting the features and benefits of the product ranges, which was very successful. Clifton displayed a range of their sous vide water baths, including the unstirred single chamber water bath and their stirred sous vide machines. Other products on display included the popular Immersion Circulator unit, which has its own carry case as an accessory and two of the Clifton Sauce BottlewarmerTM units, the popular 4 litre and the new for 2018, 28 litre Sauce BottlewarmerTM. Managing Director of Signature FSE Limited, Paula Sherlock gave an in depth presentation to the audience about her company and the important features and benefits of using Livecookintable whilst Managing Director of Clifton Food Range, Melvin Dickson, gave an informative talk on the history of Clifton sous vide products, including how in 2006 top chefs were using Clifton laboratory products for cooking food at low temperatures which led to the development of today’s brand leading products. Samples of these exquisite dishes were given to our guests so that they could taste the intense flavour which sous vide creates. Chef Davey used the Livecookintable to demonstrate the versatility of the induction modules and the option to turn cooking furniture into a buffet station for presentation of dishes. Managing Director of Clifton Food Range, Melvin Dickson, commented: “This was a brilliant live cooking event which saw our distributors discover a lot about the products in more depth. It was great that they were then able to see how a chef would use the equipment and then eat the finished result. Our chef, Davey, was engaging with the audience and the food was amazing. Thank you to the team at Signature FSE and my team at Clifton for the tremendous effort in making this event a success”.